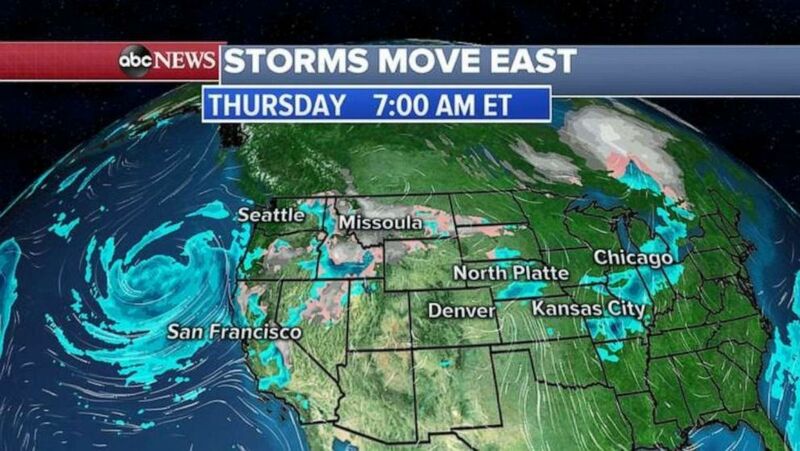 A storm that brought hail the size of golf balls to Florida on Wednesday has moved out and now we are watching our western storm to cross the country and bring more severe storms, heavy rain and even snow! Unsettled weather stretches from the West Coast all the way to the Midwest on Thursday morning with heavy rain and snow. Heavy snow has been falling on Interstate 80 in California over the Donner Summit where traffic has come to a standstill. (ABC News) Rain will move into the central U.S. over the next couple days. The rain will continue through the flooded areas of the Plains through Thursday, but it is not expected to be very heavy. By Friday afternoon and evening, a stronger storm will move into the central U.S. with heavy rain and severe storms to the south and snow to the north. 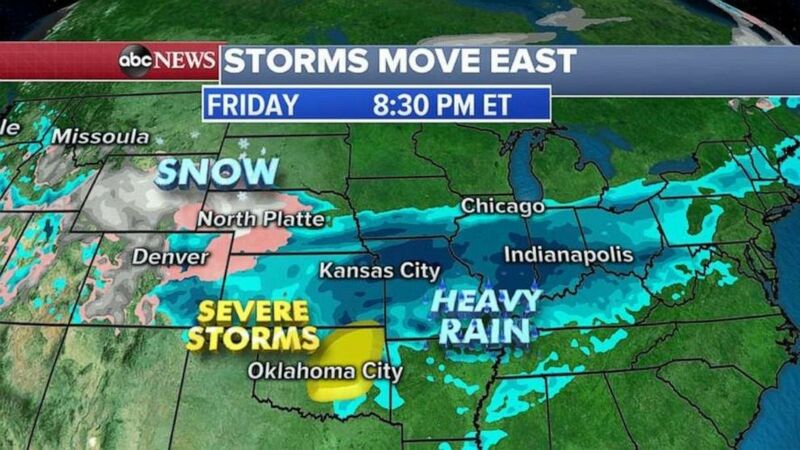 (ABC News) Heavy rain will stretch from Kansas to Ohio on Friday. 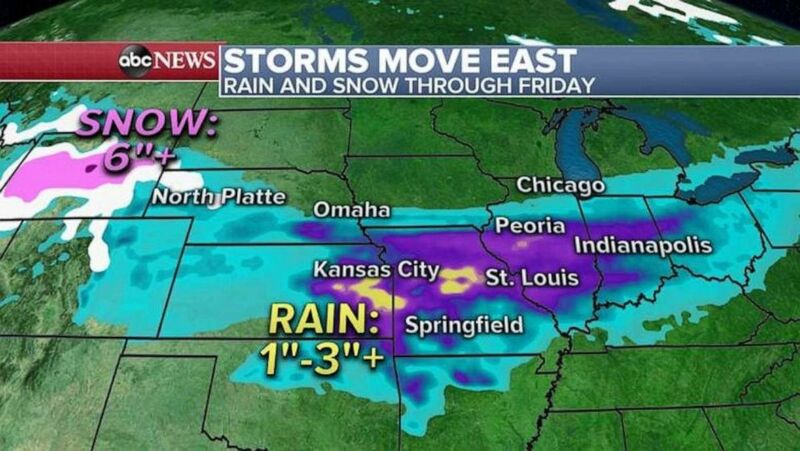 A widespread region from Kansas to Indiana is expecting 1 to 2 inches of rain, with localized amounts near 3 inches. To the north and west, more than half a foot of snow is expected in Wyoming — and even a few inches are possible in the High Plains or Nebraska. (ABC News) The heaviest rain will fall in eastern Kansas and throughout central Missouri and Illinois. Ahead of the storm, a nice warmup has arrived for most of the East. Highs on Thursday will surge near 60 degrees in Chicago and Detroit, while the warmth will move to the East Coast by Friday and Saturday. The forecast is for 60s and 70s from Washington, D.C., to Boston. 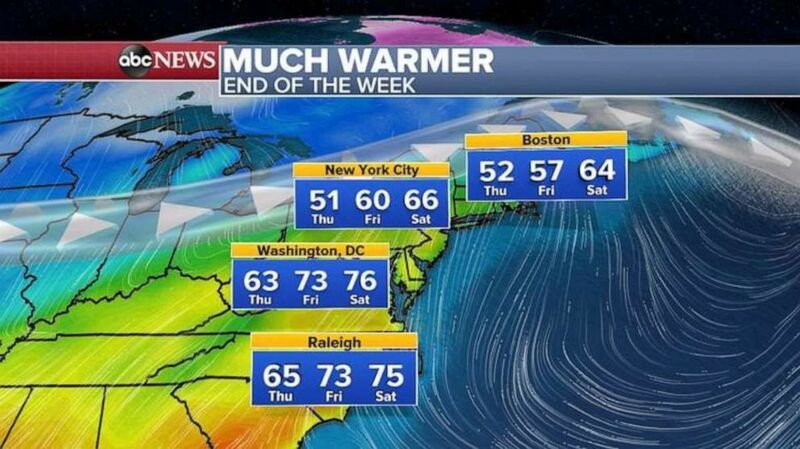 (ABC News) Temperatures will rise into the 60s and 70s on the East Coast this weekend.